For use of this term to describe diffraction peaks, also known as reflections, see Bragg reflection. The Bragg curve of 5.49 MeV alphas in air has its peak to the right and is skewed to the left, unlike the x-ray beam below. The Bragg peak is a pronounced peak on the Bragg curve which plots the energy loss of ionizing radiation during its travel through matter. For protons, α-rays, and other ion rays, the peak occurs immediately before the particles come to rest. This is called Bragg peak, after William Henry Bragg who discovered it in 1903. When a fast charged particle moves through matter, it ionizes atoms of the material and deposits a dose along its path. A peak occurs because the interaction cross section increases as the charged particle's energy decreases. Energy lost by charged particles is inversely proportional to the square of their velocity, which explains the peak occurring just before the particle comes to a complete stop. 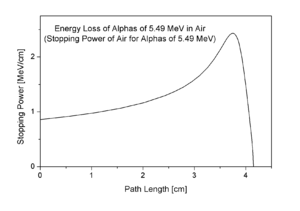 In the upper figure, it is the peak for alpha particles of 5.49 MeV moving through air. In the lower figure, it is the narrow peak of the "native" proton beam curve which is produced by a particle accelerator of 250 MeV. The figure also shows the absorption of a beam of energetic photons (X rays) which is entirely different in nature; the curve is mainly exponential. The phenomenon is exploited in particle therapy of cancer, to concentrate the effect of light ion beams on the tumor being treated while minimizing the effect on the surrounding healthy tissue. The blue curve in the figure ("modified proton beam") shows how the originally monoenergetic proton beam with the sharp peak is widened by increasing the range of energies, so that a larger tumor volume can be treated. This can be achieved by using variable thickness attenuators like spinning wedges. ↑ Charlie Ma, C-M; Lomax, Tony (2012). Proton and carbon ion therapy. Boca Raton: CRC Press. p. 4. ISBN 9781439816073. ↑ "Bragg Curves and Peaks". Brookhaven National Laboratory. Retrieved 27 January 2016. ↑ Trikalinos, TA; et al. (2009). Particle Beam Radiation Therapies for Cancer [Internet]. Comparative Effectiveness Technical Briefs, No. 1. Rockville (MD): Agency for Healthcare Research and Quality (US). pp. ES1–ES5. ↑ Paganetti, Harald; Bortfeld, Thomas. "Proton Beam Radiotherapy - The State of the Art1" (PDF). AAPM. p. 16. Retrieved 27 January 2016. Wagenaar, Douglas (1995). "7.1.3 The Bragg Curve". Radiation Physics Principles. Archived from the original on 1 March 2016. Retrieved 27 January 2016. "Bragg peak". Oxford Reference. Oxford University Press. Retrieved 27 January 2016.